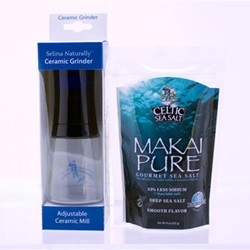 Our Grind Fresh Bundle features a perfect pairing of an exquisite salt with a dependable and attractive grinder. The Selina Naturally® Adjustable Grind Fresh Salt & Spice Mill has a dishwasher -safe, non-corrosive ceramic grinding mechanism that easily grinds both salt and spices with a simple twist of the wrist. Includes a 1/2 lb bag of our gourmet finishing salt, Makai Pure® Sea Salt.